Exploring the city of lights evokes such a sense of romance, non? Truly, there is no better place in the world to live la vie en rose-coloured filter. So grab your Longchamp and Chanel sunnies and let’s go discover the most Instagrammable locales in the city! Arguably the most iconic landmark in Paris, the Eiffel Tower has served as the backdrop for millions of people’s special moments. Engagements, weddings, family reunions, the Eiffel Tower is the main identifier in all of their photos. Take your very own snap with this piece of Parisian history. This inspired castle is pink perfection and sole proof that dreams really do come true. Up the magic on your Instagram feed and take a photo in front of the whimsical Sleeping Beauty castle. Made famous by its pretty pastel packaging and mouthwatering macarons, a post at Ladurée will make you the envy of Instagram followers everywhere. Once you capture the perfect photo of your treats, you’re left with the delicious task of devouring them all! A beautiful river that runs through the city, the famous River Seine provides travellers with an amazing backdrop for enviable Instagram photos. 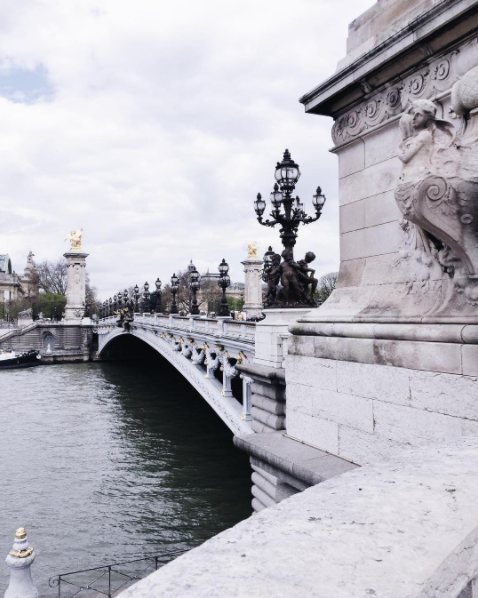 The intricate architecture of the bridges photographs beautifully and you can also take a river cruise for the most incredible views of Paris. An architectural marvel, The Louvre Museum evokes the artist in all of us. For a modern twist on your Instagram page, pose in front of the Pyramide du Louvre, a stark contrast to the historic buildings of the museum that house priceless works of art, including DaVinci’s famous ‘Mona Lisa’. When Paris is in bloom, Au View Paris d’Arcole is the place to be. The cutest restaurant that ever was is a dream of purple with vines of wisteria and pretty lilac patio furniture. Another photo-op exists beside the Eiffel Tower in the form of a delicate carousel. The gilded merry-go-round with its ornately painted horses makes for a stunning and romantic shot.